Does your writing have the ‘it’ factor? Our 5Writer’s group has been exploring the ‘it’ factor that some authors have that makes their stories unforgettable. What is ‘it’ that keep readers up all night to read just one more scene, or chapter, or heck, why not stay up and finish the whole thing? There’s nothing better than sacrificing a good night’s sleep to find out ‘what happens’. So, is ‘it’ the setting? the plot-line? the characters? the genre? or a magic combination that somehow elevates the separate bits into something extraordinary? To me an unforgettable story is a special combination of the above, plus what the author leaves out and the reader fills in. Can the ‘it factor’ be part of the reader’s imagination? Is ‘it’ a story told so well that the parts “left up to the reader’s imagination” are just as important as what is written down? For me unforgettable stories(or movies based on books) have done just that. 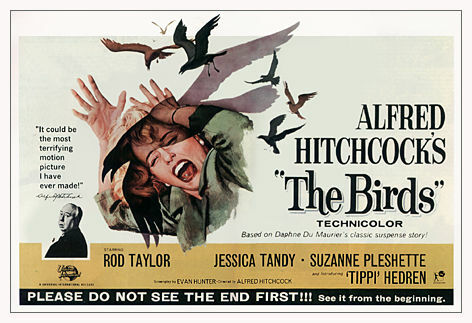 Take Hitchcock. I can still feel my heart pounding and the fear generated by my 12 year-old imagination while watching The Birds. I was babysitting at the time and was literally too afraid to go up the stairs to check on the three children sleeping there! The plot-line was important, but so was my imagination running away with what would happen if the birds really did get inside? I imagined them pecking out people’s eyes and such. It still haunts me. The ‘it factor’ is found in all genres, not just mysteries or thrillers or war stories. etc. The ‘it’ factor isn’t genre specific and when the author leaves something to the reader’s imagination it can be either part of the plot-line, &/or the characters &/or the setting. Maybe for a story to become unforgettable the ‘it factor’ needs to be developed in all parts of the story? The beauty of leaving parts of your story up to your reader’s imagination is that what each reader fills in will be unique to him/her and will depend on his/her own experience. To me this is magical. A writer can write a story that is a bit different for every reader that reads it! who hasn’t had a picture of a character in his/her mind that doesn’t match the actor playing that character when a book is made into a movie? a setting can be perceived differently by every reader. Take a snowstorm. A reader that’s been caught overnight in a storm will imagine a snowstorm taking place in a book differently than a reader that has only watched from inside a warm house. The author doesn’t need to describe the storm in detail unless it is important to the plot-line. much of the violence in stories or movies doesn’t have to be up-front blatant. A terrorist storming into a room full of children with a gun sets up what is or can happen, and the sound of gunfire without the sordid details leaves exactly what happens up to the reader’s imagination. Every reader can imagine it a bit differently depending on his/her own experience, even with the same end result. If you think about it, what readers fill in are details dependent on his/her own experiences that are also tied into their emotional reactions to those experiences. This also fits the expectation to have your reader be emotionally involved in the story! Can an author be taught this special combination of plot, setting, characters and “leaving enough up to the reader’s imagination” to elevate a story from good to unforgettable? For certain it takes hard work. And lots of it. Even the best authors admit this. Have you thought about leaving certain aspects or details up to your reader’s imagination? Do you feel this can make a better story? This entry was posted in Setting, Storytelling and tagged unforgettable stories, writer's journey by Karalee Greer. Bookmark the permalink. Great insight into “IT.” I don’t think leaving things to the reader’s imagination is the IT that keeps readers up at night, but it makes passages unforgettable. I remember Norman Mailer’s THE NAKED AND THE DEAD passage in which he revealed that Lt. Hearn was dead. One chapter ended with Lt. Hearn leading the platoon into combat against the japanese. The next chapter began with a sentence that briefly explained how the platoon’s command structure was upset when Lt. Hearn was killed, until Sgt. Croft reasserted his dominance. Lt. Hearn was not mentioned after that (men are killed in combat all the time, the war keeps going). That stayed with me for more than 50 years.There may be more than one IT. Thanks for your comments. I agree the IT factor isn’t just what’s left to the imagination, but I believe it adds an important component to a book becoming unforgettable. Maybe it’s many unforgettable bits combined with a great plot &/or characters that makes the story stick with the reader long after The End. Like you, we all have scenes in books that we remember emotionally even decades later.